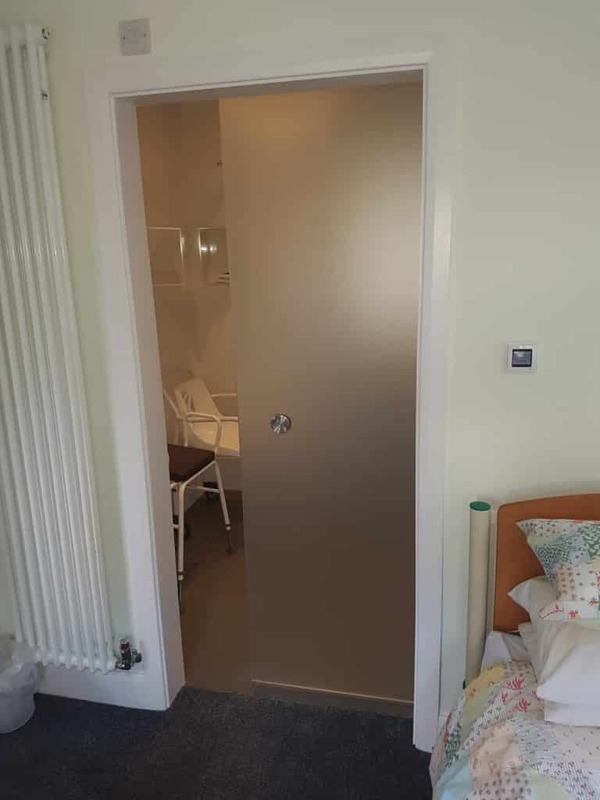 A frameless interior glass sliding door supplied and fitted by UK Windows Surrey to a shower room. 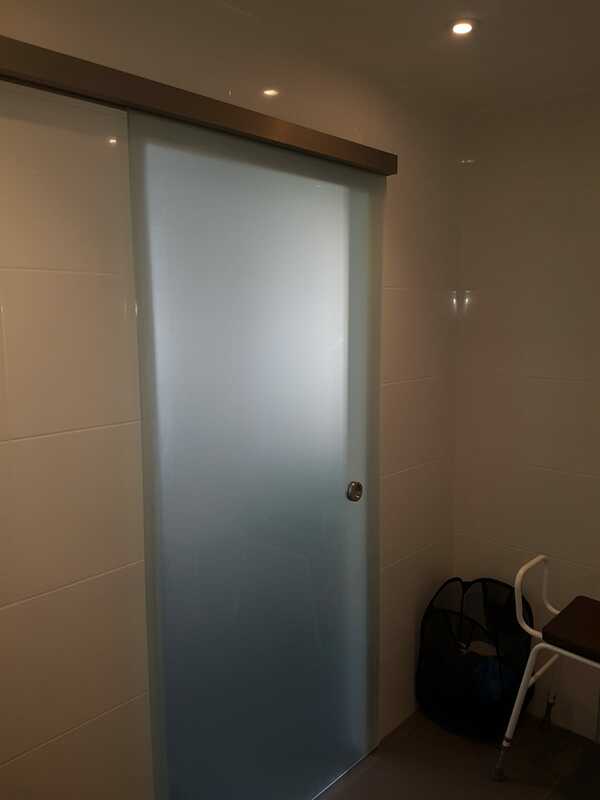 This interior glass sliding door features quality acid-etched glass, therefore providing privacy to the en-suite and natural light as well. 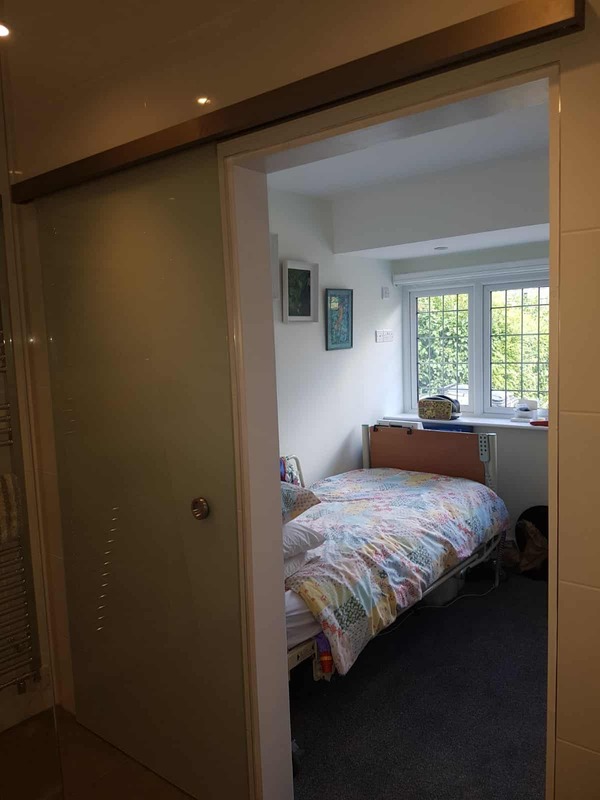 Furthermore, the door has single toughened glass providing safety and meeting current regulations. The door sliding hardware is top-brand German door fittings from Bohle. Sliding behind the interior wall, the door hangs on a track and has a guide at the bottom. The mechanism on this interior glass sliding door has dedicated carriages, end stops and bottom guides. The top track fixes neatly above the door with a modern housing. The door slides effortlessly on the quality gearing and also has a soft close facility at the leading edge. Any visible hardware is satin stainless steel, including the easy use finger pull to both sides. Finally, the door has no threshold allowing a flush floor from the bedroom to the ensuite. If you are thinking about a new interior door, contact us today to find out why glass doors offer more in the home than interior timber doors. As well as interior frameless doors, take a look at our frameless glass porches or glass splashbacks.